When is the Best Time to Paint Your Omaha Nebraska Home? We tend to have temperature extremes in the midwest. Specifically Omaha. There are times better suited to others for exterior painting around here. Most paints are made to be applied when the temperature of the substrate is 50 degrees and above as the coating dries. 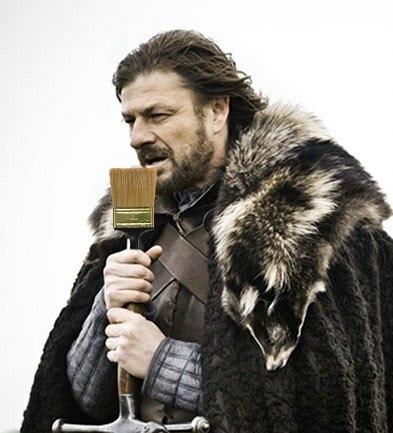 This is not necessarily a strict limitation, but a general guideline.The best time to paint in the midwest is spring and early fall. Most paint manufactures make a low-temp paint product that can be applied down to 34 degrees. Great for the paint, not so much for the painter. The low-temp line of paint was actually a separate product line for years. Most manufactures have since made most of their exterior paints also “low-temp”. The two biggest weather related problems facing painters in the Omaha Area are flash drying and painting within the dew point. Normally we think the faster a paint dries the better but paint cures best when it dries at a moderate rate. Faster is not better. Moderate temperatures occur in the spring and early fall. Flash drying occurs when paint is applied to a hot surface and “flashes” off. Most commonly painting the side of a house in direct sun light especially darker colors. The biggest danger when painting in the spring and fall is working within the dew point. The dew point is the temperature at which the air can no longer hold water vapour and a percentage of it starts to form water droplets (condensation). A safe rule of thumb is to paint when the temperature is at least five degrees above the dew point and plan your work so the paint has time to cure prior to the temperature dropping within the dew point.